Our parish is located in the heart of the scenic East Tennessee, not far from Knoxville and the Great Smoky Mountains and only 15 minutes from the center of Tellico Village. Whether you are from this area or visiting, we welcome you to join us. Anointing: Please notify the parish office if you know anyone is seriously ill or in the hospital. (We will not be notified by the hospital due to patient confidentiality). Confirmation: Requires 1 year study and one retreat. Marriage: Requires a minimum 6 month notice. We welcome you to St. Thomas and hope that you will soon feel like a part of our community of faith. If you are visiting with us or have not registered at the parish, we would love to get to know you better! You may stop in the office to register or pick up a registration form in church, or even register online (click here). Please help us be attentive to those who are ill, homebound or in the hospital. Either the patient or a family member must notify the parish. Communion can be brought to the home or health-care facility by calling Bob at 865-458-4550. An invitation is extended to parishioners to attend. Masses are the 3rd Wednesday at 10:30 AM, celebrated by one of our priests. St. Thomas is a very active parish with many opportunities for spiritual growth, social interaction, and volunteer ministry. Becoming active in ministry or volunteering is one of the best ways to participation in the community of St. Thomas. 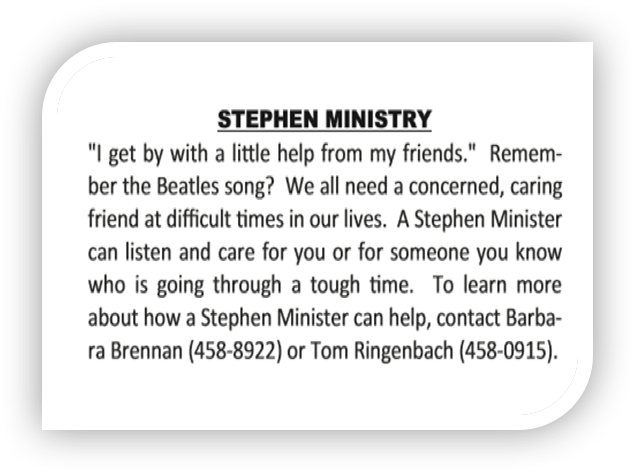 Please click here to see the individual ministry tabs for more information. We hope that you will find an area that interests you and that your find fulfilling.